WHICH British communist had the most impact on public life worldwide this last century? Miners’ leader Arthur Horner? Marxist ideologist Rajani Palme Dutt? The answer, most likely, is the historian Eric Hobsbawm. By the time of his death in 2012 he was the most famous historian in the world, his books translated into almost every language, and he was celebrated wherever he went – particularly, for no very obvious reason, in Brazil. Why and how this occurred is a subject worth exploring. Certainly, part of the answer lies in Hobsbawm’s extraordinary talents. He also caught the political breeze, ascending to his greatest fame at the time when the cause he had championed – communism – and the theory he steered by – Marxism – had apparently descended to the depths of historical detritus. That is not what he would have wanted. Richard Evans is himself an eminent historian, who has written brilliantly on the Third Reich and its war. Yet this book, which really leaves no room for any further biography of his subject, is somewhat unsatisfying. That is not on grounds of skimping on detail. In fact, there is far too much of it, on points of limited interest. Hobsbawm today is celebrated for two things: the run of remarkable books which began with The Age of Revolution, redefining the study of the history of society, and his intervention in left political strategy in Britain from 1978 through to the advent of Tony Blair. However, it takes Evans nearly 400 pages to arrive at the first landmark, nearly two-thirds of the text’s length. That seems to be excessive dawdling. Prior to the publication of the Age of Revolution, Hobsbawm’s life could be described as interesting without being in any way exceptional. An upbringing in Vienna, fascination with the strength of communism in Weimar Germany, joining the Communist Party, wartime service closely monitored by MI5, a failed marriage, the obstruction of his advance within academia as a result of a mild British McCarthyism — this could have been covered in a quarter of the pages without omitting anything of consequence. Securing access to a wealth of private sources seems to have overwhelmed Evans and his editor. Culling the account of Hobsbawm’s slow ascent to eminence might have left more room for exploring the sources of his intellectual power, permitting an examination of the ambiguities of Hobsbawm’s life and work. Evans does address these but they are somewhat lost amidst a mass of marginalia concerning his travels, affairs, house moves and academic ups and downs. He draws a picture of a semi-detached communist at ease in a sort of agnostic Marxism, critical of the Establishment yet rather drawn to it at the same time and of a somewhat tormented personality, at least until his second marriage and the birth of his children brought personal stability in middle age. Whereas Evans is able to represent the rise and partial eclipse of Hobsbawm’s Marxism fairly successfully, he is less sure-footed in relation to his membership of the Communist Party of Great Britain. There are a few minor errors of fact here and Evans’s claim that “intellectuals were… barely tolerated in its ranks” is simply wrong. The party had, from the 1930s through to the 1960s, a stellar roster of artists, scientists and academic specialists in every field among its members. To paint Hobsbawm as a CPGB member in name only, paying little attention to policy or discipline from the crisis of 1956 onwards, is accurate enough. However, his fierce earlier commitment is somewhat underplayed and he is held out as a rebel from the earliest days of his membership. This is not how Hobsbawm himself presents the matter in his autobiography, where he lays stress on the centrality of party membership to his life for his first 20 years in the CPGB. His strained relationship with it is played out through transcripts acquired from MI5’s bugging of the party’s headquarters. Ironically, one of his main critics seems to have been George Matthews – an editor of the Daily Worker and the Morning Star – though subsequently they were very close politically. The last time I saw either they were together in a reception at Hampstead Town Hall, where both kindly donated to the Stop the War Coalition, which I then chaired. Yet Hobsbawm remained a member of the party until its dissolution in 1991, 35 years after most of his peers in its extraordinary historians’ group had resigned. Evans does not really explain why, apart from indicating that Isaac Deutscher advised Hobsbawm against leaving. At any event, he did not become one of the “spineless intellectuals” leading communist Andrew Rothstein railed against in 1957. Hobsbawm’s main post-1956 political intervention was to tell the British labour movement in 1978 that its advance had been halted. He briefly became a sort of hate figure for some of his comrades, yet he was evidently right when most of us were wrong. Like others of the same view, however, he was unable to translate this insight into a viable plan for resuming the advance. Perhaps a professional historian should not have been expected to but his opposition to Tony Benn in the 1980s scarcely assisted. His march-halting analysis was of most practical use to the New Labour project which, to be fair, Hobsbawm did not like either. Evans outlines the range of Hobsbawm’s great histories and is stronger on the process rather than the well-springs of this achievement. He is no hagiographer, drawing attention to the blank spots in Hobsbawm’s panoramic sweep. It seems that he had no time whatsoever for any cultural development occurring in the last 50 years of his life and his attitude towards Africa showed small advance on Hegel’s. Most seriously, women clearly did not hold up half the Hobsbawm sky. He had no great understanding of feminism or women’s dynamic role in society and they fell victim to a class reductionism that he did not otherwise really embrace. This speaks to Hobsbawm’s particular Marxism, revisionist yet simultaneously conservative. Marxism is sometimes described solely as an analytical tool and as such Hobsbawm used it to enduring effect. It is also, however, a partisan weapon. It does not sit outside of, and indifferent to, the struggles within which it is deployed. Here, Hobsbawm’s semi-detachment became problematic. In 1998 he declared that “much of what Thatcher did needed doing.” I asked him at the time, without success, to explain what he meant. He was, by then, a member of the Athenaeum gentleman’s club and en route to accepting an honour from the Queen on Tony Blair’s recommendation. This sense of the intellectual standing aloof from the struggle also permeated his later writing. That may have been critical to his success but he did become less Marxist. The Age of Extremes, the last volume in his magisterial survey of history from the start of the French revolution in 1789 to the end of the Russian in 1991, is much the least rewarding politically — although not commercially, as Evans advises in a weary trudge through contracts, royalties and receipts. This was because he had by this stage largely discarded the centrality of class and thus lost his main narrative thread, as Evans points out. Unlike his previous “ages” — of revolution, capital and empire — the title of the final volume was question-begging: what are these extremes and must we stand equidistant from them? By the time it was written there was nothing left of Hobsbawm’s communism, beyond a dignified refusal to disown his past. He was instead a national treasure, as Evans outlines. Nevertheless, Companion of Honour and all, the Internationale was sung at his funeral and he rests near Marx in Highgate cemetery, a parable of the toils of the internationalist intellectual in the homeland of Anglo-Saxon pragmatism. 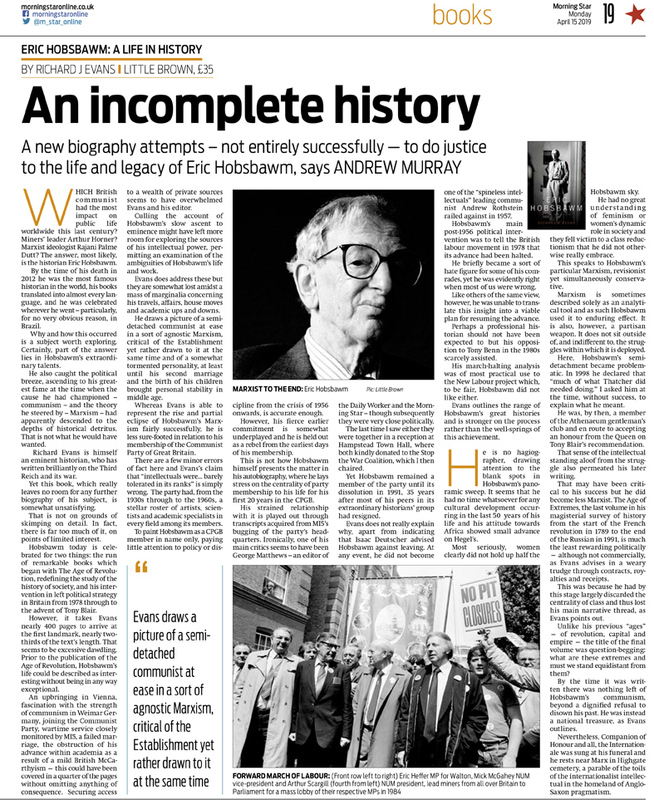 Eric Hobsbawm: A Life in History is published by Little Brown, price £35. ← April Socialist Voice is out!